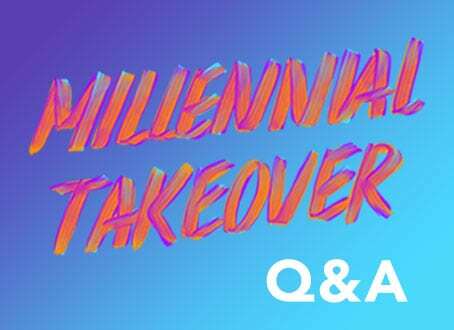 This interview is the first of nine in a series of Q and As with leading changemakers, representing the Millennial generation who are working across sectors to be the force for change on the issues they care about most. My driving purpose is helping others uncover their courage, value and potential. When I started Count Me In as a small project back in high school, I had no idea it would grow to be a global brand impacting millions. In fact, I still have a hard time believing it to be true today! Count Me In is now the largest youth-led organization in the world, inspiring students to be positive change-agents in their communities. Youth (and anyone for that matter) not seeing their own innate value. So many people genuinely don’t believe that they matter, and it breaks my heart. That’s why I’m so passionate about the mentorship programs my team and I have designed at Count Me In. From national school tours to global leadership training camps, Count Me In offers world-class youth empowerment programs infused with emotional intelligence. With technology, the barriers to communication, sharing of stories and even taking action in support of a cause have continued to come down – how do you think that has influenced the way you and others take part in social movements today? The fact that someone in a remote fly-in community can seamlessly learn from, partner with or work for an organization on the other side of the world is incredible. When used thoughtfully, technology is a powerful vehicle for empowerment and grassroots social movements. Count Me In would have never grown at the rate it did without technology and social media. Our first global broadcast reached 2.2 million people around the world. That’s 2.1 million more people than what we could have impacted without technology. How do you meet young people where they are to encourage engagement with social issues today, and why is that approach so important? Listen. Teens desperately want to feel seen and heard. Meet teens where they’re at, invest time with them and practice listening. It sounds simple but I promise it is one of the most powerful practices when used intentionally and consistently. The entire Count Me In Leadership Team is comprised of young leaders I admire. Count Me In is their movement as much as it is mine. They are the team behind the Count Me In Leadership Summit (http://CountMeInSummit.com) which is our most recognized global program, uniting young leaders aged 11-23 for advanced leadership training and community building. In addition to speaking at companies, conferences and schools, I have started consulting for other companies and organizations, helping them increase their impact and think of their brand as a “movement.” That’s a core focus for me right now and has me very excited.